Background/Aim: Emergency surgeries have increased in Saudi Arabia. This study examines these surgeries and associated complications. Patients and Methods: This was a prospective multicenter cohort study of patients undergoing emergency intraperitoneal surgery from the eight health sectors of Saudi Arabia. Patients' data were collected over 14 days. Results: In total, 283 patients were included (163 men [54.06%]). The majority of cases were open surgery (204 vs. 79). The 24 h and 30-day mortality rates for the cohort were 0.7 and 2.47%, respectively. Twenty-nine patients (10.24%) required re-intervention, while 19 (8.12%) needed critical care admission. The median length of hospital stay was 3 days. Multivariate analysis showed American Society of Anesthesiologist (ASA) classification score (P = 0.0003), diagnosis (P < 0.0001), stoma formation (P = 0.0123), and anastomotic leak (P = 0.0015) to correlate significantly with 30-day mortality. 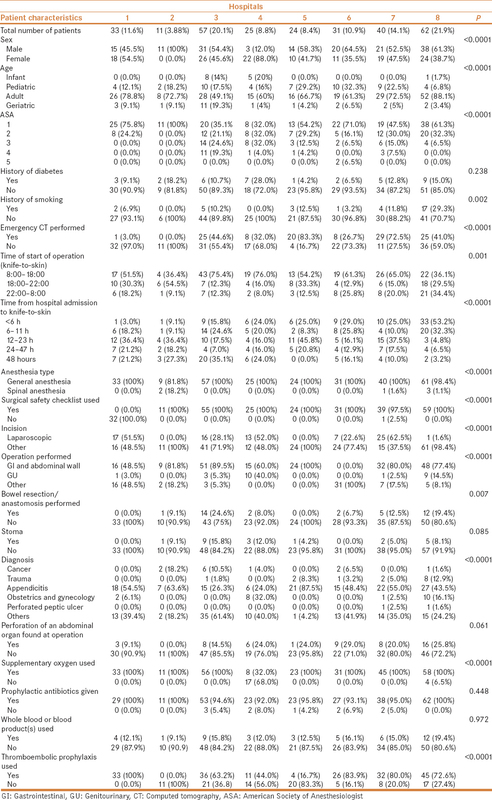 Conclusion: American Society of Anesthesiologist score, diagnosis, stoma formation and anastomotic leak are associated with 30-day mortality after emergency surgery in Saudi Arabia. Contributed equally as first authors. Surgery is considered one of the essential healthcare services. As many demographic parameters have shifted over the years, there has been an increase in emergency surgeries in Saudi Arabia. This increase is attributed to population growth, which is estimated to be approximately 2.6% per year  and improved access to healthcare facilities in the Kingdom. These complications represent a national health burden. The Ministry of Health (MOH) has a total of 261 hospitals, which constitute 60% of the total healthcare services in Saudi Arabia. The number of emergency cases in MOH hospitals was 21,476,768 persons in 2013, up from 16,881,258 in 2009 with an annual growth rate of 27.2%. Based on the 2014 Human Development Index, Saudi Arabia was ranked 39 out of 188 countries. Unfortunately, healthcare services still face many challenges. Those challenges can be addressed once a better understanding of the current conditions is achieved. Data collection to reflect details of the present care status and gaps in either infrastructure or services are vital to reaching any improvement. Thus far, such data have been lacking. There is variation in the patterns of emergency abdominal surgery, which can be related to changes in demography, socioeconomic status, healthcare system, diet, or geographical factors that can affect surgical outcomes. These variations can be observed at the national level as well. The current literature does not include in-depth studies investigating complications of emergency abdominal surgery and factors contributing to this outcome. However, these operations represent a significant disease burden in the international and national setting. Identifying current practices and complications involved in the emergency surgical setting can have a significant impact on patients of all ages and increase the expected lifespan and quality of life for those patients. This can be achieved by conducting large-scale prospective studies with specific data points related to emergency abdominal surgery complications and related protocols. This study aimed to determine modifiable practices that will aid in the creation of clinical protocols related to emergency abdominal surgery, thus decreasing operative morbidity and mortality and potentially affecting the economy. This study is an extension of the International GlobalSurg 1 project. It is a multicenter prospective observational study that included all consecutive patients from all age groups (adults and pediatrics) undergoing emergency intraperitoneal surgery (unplanned, nonelective, same admission) during the chosen 2-week period. This includes patients undergoing re-operation after a previous procedure. All intraperitoneal surgical approaches are included. We excluded patients undergoing a cesarean section, elective surgeries scheduled in advance, or semi-elective surgeries (when the patient is admitted as an emergency case, then discharged from the hospital for scheduled surgery at a later date). We used data points adapted from the GlobalSurg international project. Collaborators from each center chose a consecutive 14-day data collection period during a 7-month period (Sep 2014–Apr 2015) to suit their availability and research capacities, for a minimum of 1 period and a maximum of 3 periods during the study interval. We recruited centers from all five sectors of Saudi Arabia (central, north, south, east, and west) to participate in this study to obtain a national view of the status of emergency surgery in the Kingdom. We excluded hospitals that may have a selection bias in their patient population, such as military hospitals. The primary outcome measure was the 24-h perioperative mortality rate, including intraoperative deaths. To ensure practicality for the individual collecting data, the primary outcome measure included simple data points that are widely applicable, easy to determine, clearly defined, and related mainly to inpatient hospital care. Secondary outcome measures included 30-day perioperative mortality rate. If the 30-day follow-up was unavailable, patients were considered lost to follow-up. Other secondary outcomes included major complications within the 30-day follow-up period. Major complications represent grade III and IV of the Clavien-Dindo classification, and include intensive care unit admission or any intervention whether endoscopic, surgical, or radiologic. Each hospital had a leader responsible for the data collection. At each center, a maximum team of two collaborators was allowed. The leaders were responsible for identifying patients and collect data as per a shared electronic clinical research form. Submitting centers with >5% missing data were excluded from the analysis. All participating centers registered their infrastructural, human resources, equipment, and intervention details based on a World Health Organization analysis tool. There was no minimum number of patients per center. Institutional review board approval for all centers was obtained before any data collection. All data were managed centrally, and data from each of the centers were accessed only by the investigators from the same center. Data collection and storage was done using a secured online web page (CAISIS: an open source, web-based, patient data management system) and all patients were anonymized. No hard copy of the data was allowed. The CAISIS system was provided via The Liver Disease Research Center at King Saud University Medical City (http://solidregistry.com/). Eight hospitals were included in the final analysis and made up the study population. Five hospitals were academic teaching hospitals, two were secondary level institutions, and one was a tertiary institution. Hospital volume was determined in the final analysis based on the number of cases recorded during the data collection period as follows: low-volume hospitals, <30 cases, medium-volume hospitals, 31–50 cases, and high-volume hospitals, >51 cases. Data are expressed as means and standard deviations when normally distributed or as medians and range when non-normally distributed. The Chi-square test was used to examine the association between categorical variables and the t-test was used for continuous variables that were normally distributed; otherwise, we used a nonparametric test. Data were analyzed using JMP®, Version 11. SAS Institute Inc., Cary, NC, 1989–2013. A total of 283 patients were included in the final analysis, with a slight male predominance of 54.06%. A history of diabetes was present in 35 patients (12.54%), and 32 patients (12.5%) were smokers; of those, 20 (7.09%) were still smoking at the time of the operation. Median patient age was 28 years (range, 0 [less than a year] to 87 years). The majority of patients (164 [58.57%]) did not undergo emergency computed tomography (CT) of the abdomen. The majority of patients (163 [57.80%]) underwent operation during the daytime, i.e., before 6 pm. Most surgeries (75 [26.50%]) took place within the first 6 h after admission. A surgical safety checklist was used in the majority of the operations (244 [88.09%]), whereas a checklist was not used in 32 cases (11.55%) as it was unavailable to the treating team. Most surgeries were supervised by a qualified surgical specialist (277 [98.23%]), but five operations (1.77%) were performed by a medically qualified nonspecialist with experience of <5 years; additionally, eight procedures (2.92%) were done with an anesthesiologist who had <5 years' experience. The median length of hospital stay was 3 days (range, 0–65 days). 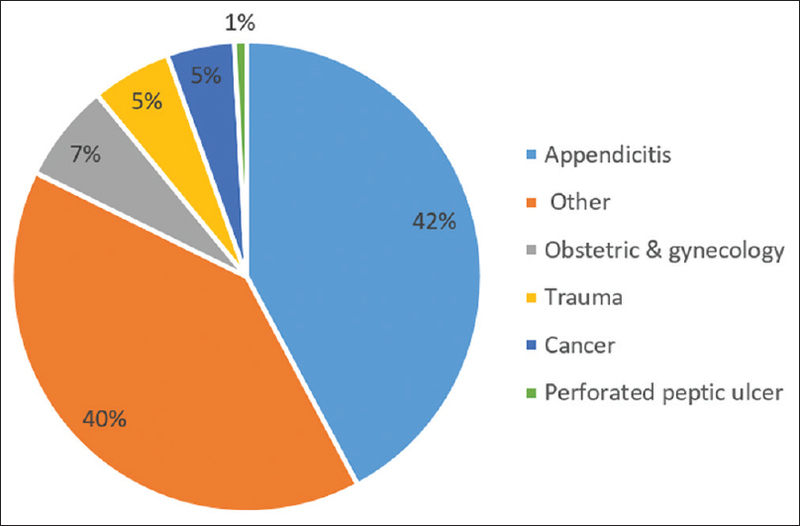 The greatest proportion of patients presented with appendicitis (131 [46.29%]), followed by symptomatic gallstones (19 [6.71%]), ectopic pregnancy (16 [5.65%]), and hernia (14 [4.95%]). Fifty-one (18.14%) patients had a perforated viscus. The majority of patients (204 [72.08%]) underwent open surgery, and only 79 operations (27.91%) were done laparoscopically. The right iliac fossa (Gridiron/Lanz) incision was the most common incision (91 [32.16%]), followed by the midline incision (64 [22.61%]). Thirty-six patients (12.76%) underwent bowel resection with 21 patients requiring stoma. Supplemental oxygen was not used during the operation in 20 patients (7.12%). Prophylactic antibiotics were used in 266 patients (96.38%); 3 patients (1.09%) were not given antibiotics due to unavailability. Forty-three patients (15.19%) received blood or blood products, and 127 patients (44.88%) were given thromboprophylactic therapy, including both drug and mechanical methods (39 [13.78%] by drug only, 19 [6.71%] by mechanical only); 96 patients (33.92%) did not receive thromboprophylactic treatment. The 24 h and 30-day mortality rates for the cohort were 0.7 and 2.51%, respectively. Forty-one patients (15.07%) had complications, and 29 patients (10.25%) had complications requiring re-intervention. Of those, 15 (5.30%) underwent surgery, 11 (3.89%) underwent radiological intervention, and 3 (1.06%) underwent endoscopy. Among reported complications, there were 7 patients (2.56%) with an anastomotic leak, 20 (7.32%) with abscesses, and 36 (13.04%) with wound infection. Univariate analysis for variables correlating with 30-day mortality revealed the following: American Society of Anesthesiology (ASA) classification (P< 0.0001), time from admission to surgery (P = 0.0046), stoma creation (P = 0.0349), the patient diagnosis (P< 0.0001), blood transfusion (P = 0.0051), length of stay (P< 0.0001), anastomotic leak (P = 0.0003), wound infections (P = 0.0316), and major complications (P< 0.0001). Multivariate analysis showed ASA (P = 0.0003), diagnosis (P< 0.0001), stoma formation (P = 0.0123), and anastomotic leak (P = 0.0015) to correlate significantly with 30-day mortality. This snapshot of data for the period 2014–2015 gives a better representative sample of patients treated at our national hospitals. In the GlobalSurg Collaborative report project, the 24-h mortality rate in high-income countries was 75/291 (25.8%), and the 30-day mortality rate was 216/291 (74.2%) compared to 2/283 (0.7%) and 7/283 (2.47%), respectively, from our data. Thirty-day mortality strongly correlated with ASA ≥3, grade III or IV complications, stoma formation, diagnosis, and anastomotic leak, whereas the GlobalSurg report project showed that ASA ≥3, neoplasm, a complication from a previous procedure, trauma, and perforated viscus correlated with 30-day mortality by multivariate analysis. When comparing patient characteristics [Table 1] there are variations between hospitals with significant P value for ASA, gender, age, smoking history, CT performed, time of start of operation (knife-to-skin), time from hospital admission to the start of surgery, anesthesia type, using surgical safety checklist, incision, operation performed, bowel resection, diagnosis, supplementary oxygen, and thromboembolic prophylaxis. Variations are also seen in patient outcomes when comparing hospitals [Table 2]. There is no significant variation in 24 h and 30-day mortality between hospitals, but there is a significant variation in morbidity. This variation can be attributed to hospital volume, trauma center level, and hospital protocols. This shows that hospitals can be an independent risk factor following emergency abdominal surgery. More data are needed to determine the role of hospital as a risk factor following emergency abdominal surgery. The majority of patients undergoing laparoscopic surgery are young patients with fewer comorbidities and a lower overall complication rate, reduced length of hospital stay, and no reported mortality during 30-day follow-up. The group of patients undergoing open surgery included more patients (204 [72.1%]); this group included a wider age range, had a higher rate of complications, and included all cases of reported mortality. Laparoscopic surgery significantly improved surgical patient's outcome and proved its efficacy in elective abdominal surgery, with less morbidity and mortality rates in all age groups. In the emergency abdominal surgery setting, it is not widely utilized, as it requires specific experience and more in-depth laparoscopic skills, and can miss some injuries related to abdominal trauma. In our study, in the laparoscopic group, we found better outcomes, which may be attributed to selection bias from the treating surgeons. A long length of hospitalization was observed in most cases. For appendicitis cases, the median duration of stay was 2 days for open appendectomies [Figure 1]. As appendectomies incur considerable costs for the healthcare system, any minute change in the hospital policy can positively influence healthcare costs. A study by Farach et al. showed that same-day discharge using the fast-track concept was safe and cost-effective. In their study, out of 206 patients eligible for same day discharge, 185 (90%) were successfully discharged according to the protocol they developed with a complication rate of 2.7%. The median reduction in cost was US$ 4111 per patient. This study included patients younger than 21 years old. The same concept was also described for adults for procedures that involve cholecystectomy, bariatric surgery, colorectal surgery, and other operations by avoiding factors that delay postoperative recoveries, such as surgical stress and organ dysfunction. These protocols showed a reduced length of stay and reduced complication rate. The investigators also showed these measures to be feasible even in an emergency setting, especially for minor procedures, and these results were confirmed by a recent retrospective study from Denmark. Most of the included patients were adults, with slight variation across the different hospitals. Hospital 3 had the most number of geriatric patients (11 [19.3%]), where all of these patients had high ASA score and thrombolytic use. This might be ascribed to a large number of overall admissions at this hospital, including 57 patients, 20.1% of the total patients in this survey. Our data aligns with international findings, which suggest that the most common emergency abdominal surgery is an appendectomy [Figure 2]. From the GlobalSurg Collaborative report in 2016, the most common diagnosis was appendicitis in high-, in middle-, and low-income countries. One study from one center in Saudi Arabia investigated nontraumatic acute abdomen and reported acute appendicitis as the most common diagnosis (47%), followed by nonspecific abdominal pain (19%) and gallstone disease (11%). Surgical intervention was indicated in 65% of the admissions. The majority (77%) underwent appendectomy; this can be explained by the young population demographic in Saudi Arabia despite the high income. The mean length of hospital stay was 6.6 days. The duration of hospital stay increased significantly with age, which is expected based on previous studies. The perforation rate found during surgery was 18.15%, which is slightly higher than the percentage of perforation reported by the GlobalSurg Collaborative group (16.2%) for height development index countries; we also see variations between hospitals in the rate of perfection. Secondary peritonitis claims 20% of surgical patients with an associated mortality rate of 30–50%, despite recent medical advances., The diagnosis and outcome of secondary peritonitis are determined by the duration of the abdominal infection, the perforation site, and the patient's general state. This study has some limitations, including variation in the number of patients from each center and the limited number of centers representing the different regions of Saudi Arabia. There are missing data in regards to the follow-up, as some patients did not follow-up in the clinic after surgery, or missing documentation was found at the follow-up appointments. The study also lacks information on medical complications after surgery and the causes of mortality, which can play a vital role in the complication rate and morbidity. We demonstrated that ASA, diagnosis, stoma formation, and anastomotic leak are associated with 30-day mortality after emergency surgery in Saudi Arabia. However, further studies are needed to investigate the economic burden and the effect of specific practices on outcomes of emergency abdominal surgery. Country statistical profiles (2015) WHO, available from: http://applications.emro.who.int/dsaf/EMROPUB_2015_EN_1904.pdf?ua=1&ua=1. [Last accessed on 2016 Jul 01]. Health resources indicators, Number of MOH hospitals, published 02/04/2015, available from: http://www.moh.gov.sa/OpenData/KPIs/HealthResourcesKPIs/HealthFacilities/Number%20OfMoHHospitals/YB_POP_BEDS_MOH_HOSP.xlsx. [Last accessed on 2016 Mar 02]. Health statistical yearbook. Riyadh, Saudi Arabia: Ministry of Health; 2009. Health services and activities indicators, Number of emergency cases at MOH's hospitals, published 02/04/2015, available from: http://www.moh.gov.sa/OpenData/KPIs/ActivitiesAndHealthServicesKPIs/Emergency/NumberOfEmergencyInMoHHospitals/YB_MAIN_RSCR_SRVC_TOT_PATIENTS_Case_Type 3.xlsx. [Last accessed on 2016 Mar 03]. Human development report 2014. The Real Wealth of Nations: Pathways to Human Development. New York: United Nations; 2014. Soreide K AD, Bergenfelz A, Beynon J, Connor S, Deckelbaum DL, Dejong CH, et al. Strategies to improve clinical research in surgery through international collaboration. Lancet 2013;382:1140-51. Haynes AB WT, Berry WR, Lipsitz SR, Lipsitz SR, Breizat AH, Dellinger EP, et al. A surgical safety checklist to reduce morbidity and mortality in a global population. N Engl J Med 2009;360:491-9. Kwok AC FL, Baltaga R, Lipsitz SR, Merry AF, Dziekan G, Ciobanu G, et al. Implementation of the World Health Organization surgical safety checklist, including introduction of pulse oximetry, in a resource-limited setting. Ann Surg 2013;257:633-9. Funk LM1, Weiser TG, Berry WR, Lipsitz SR, Merry AF, Enright AC, et al. Global operating theatre distribution and pulse oximetry supply: An estimation from reported data. Lancet 2010;376:1055-61. Obonna GC, Arowolo OA, Agbakwuru EA, Etonyeaku AC. Emerging pattern of emergency abdominal surgeries in Ile-Ife Nigeria. Niger J Surg Sci 2014;24:31-5. Trevino CM, Katchko KM, Verhaalen AL, Bruce ML, Webb TP. Cost effectiveness of a fast-track protocol for urgent laparoscopic cholecystectomies and appendectomies. World J Surg 2016;40:856-62. Bhangu A, Fitzgerald JE, Fergusson S, Khatri C, Holmer H, Søreide K, et al. Determining universal processes related to best outcome in emergency abdominal surgery: A multicentre, international, prospective cohort study. BMJ Open 2014;4:e006239. Bickler SW, Spiegel D. Improving surgical care in low- and middle-income countries: A pivotal role for the World Health Organization. World J Surg 2010;34:386-90. GlobalSurg Collaborative. Mortality of emergency abdominal surgery in high-, middle- and low-income countries. Br J Surg 2016;103:971-88. Farach SM, Danielson PD, Walford NE, Harmel RP Jr, Chandler NM. Same-day discharge after appendectomy results in cost savings and improved efficiency. Am Surg 2014;80:787-91. Dogan K, Kraaij L, Aarts EO, Koehestanie P, Hammink E, van Laarhoven CJ, et al. Fast-track bariatric surgery improves perioperative care and logistics compared to conventional care. Obes Surg 2015;25:28. Feroci F, Lenzi E, Baraghini M, Garzi A, Vannucchi A, Cantafio S, et al. Fast-track colorectal surgery: Protocol adherence influences postoperative outcomes. Int J Colorectal Dis, 2013;28:103. doi: 10.1007/s00384-012-1569-5. Ansari D, Gianotti L, Schröder J, Andersson R. Fast-track surgery: Procedure-specific aspects and future direction. Langenbecks Arch Surg 2013;398:29. Ordonez CA, Puyana JC. Management of peritonitis in the critically ill patient. Surg Clin North Am 2006;86:1323-49. Al-Mulhim AA. Emergency general surgical admissions. Prospective institutional experience in non-traumatic acute abdomen: Implications for education, training and service. Saudi Med J 2006;27:1674-9. Wittman DH, Schein M, Condon RE. Management of secondary peritonitis. Ann Surg 1996;224:10-8. Doklestic SK, Bajec DD, Djukic RV, Bumbaširević V, Detanac AD, Detanac SD, et al. Secondary peritonitis -evaluation of 204 cases and literature review. J Med Life 2014;7:132-8.